Impala stand 90 cm / 35 inch at the shoulder, with a mass of 60 kg / 130 lb.. Medium-sized antelope, slight build with graceful appearance, slender body comparable with that of a springbuck. Generally, impala have shiny, bright yellowish to red-brown coats, slightly lighter at the flanks. The black-faced impala has a dark face marking and a white band above the eyebrows. Chin and throat, inner thighs an under parts white in colour. Medium-long and bushy tail. Long slender, lyrate horns which, swinging back from the head in an S-shape bow outwards, then inwards and slightly forward to the sharp, inwardly directed points. Does resemble bucks, but they are smaller in size and carry no horns. Acacia savanna, light mopane woodlands and thorn-bush savanna. 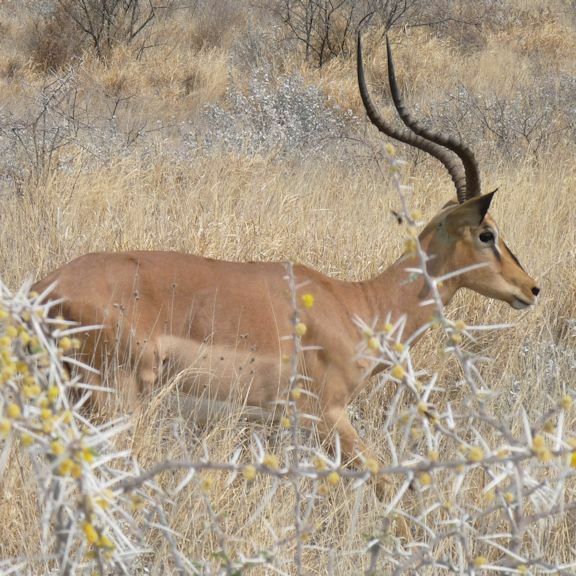 The black-faced impala is found in the northern Namibia, Etosha National Park and Kunene region and on few hunting ranches in the country through introduction. The impala has adapted well to the local conditions. Leaves of trees and bushes, but also short grass and fruit. Impala depend strongly on water, they can, however, over a longer period of time, cover their water needs through dew. Only the bucks, horn length up to 70 cm / 28 inch. Impala are gregarious, occurring in small herds comprised of one buck and 10 - 20 does and in larger congregations of up to 100 during the cold season. Adult bucks show territorial behaviour, although observation suggests that they associate with juvenile bucks in bachelor groups. During the rut, territorial males defend their territories aggressively from other males, which try to evict them. In addition to direct aggression the territories are defended by series of loud grunts. Impala are diurnal and nocturnal. Loud, high snort, especially when agitated.